Today as I drove past the road leading to Steventon on my way from work, I couldn't resist the temptation to brave the weather and drive through Steventon to catch a glimpse of the village in its wintry glory. Steventon is the birthplace of Jane Austen where she lived the first 26 years of her life. I took these photos from the tiny road leading to St Nicholas Church where Jane Austen's father, George Austen, was Rector. Snowdrops adorned the entrance to the church (which to my disappointment was closed for the day). The area around St Nicholas Church had an eerie feel about it during the misty hours of the afternoon. Quite a different experience to visiting here in the summer. Scenes of idyllic village life. I had to have a peek through the high, thick hedgerow to the field where Steventon Rectory once stood. This was where Jane Austen was born and where she grew up. As I drive through the beautiful Hampshire countryside, I can certainly understand why Jane Austen loved her home county and neighbourhood so much. 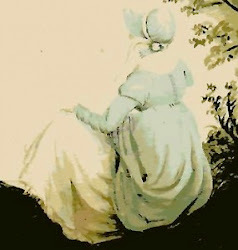 These are beautiful and poignant scenes of Austen's countryside. Amazing that it still looks so peaceful and rural. It's easy to imagine her father standing at the church door, and the family walking up for services. You have given a gift to those of us who love her books and her life so much . . . which must be half the world! Hi Tony! I think most of the snow has melted by now with the rain and warmer weather, but there was still a fair amount of slush on the roads around Steventon yesterday - enough to give me anxiety! I visited Worthing last year, but hadn’t thought about the Sanditon connection. Thank you we are all very well and the kuds have enjoyed the snow. Hope you are all well too? Would love for you to add some valuable comments and feedback!